A nice chunk of the story if I do say so myself. Looks to be even more than what I listened to Gene read when I attended MadCon nearly three years ago. I’m looking forward to seeing what I can remember and what he might have changed. It feels like we’ve been waiting forever for this one to finally arrive and I can’t wait to get my hands on it at the end of November! UPDATE: Cory Doctorow posts about the excerpt here. 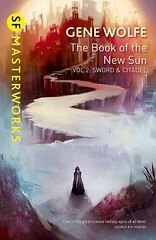 Tor.com has a nice write up about the growing number of Gene Wolfe titles now available as eBooks. You can give those hard copies a rest, and load one of these up on your Nook or Kindle instead. My hopes are to see the complete Long Sun series available soon. Seawrack from “On Blue’s Waters” appears in a Gallery of Favorite Mermaids on Tor.com. Always cool to see Gene Wolfe make these fun little lists. The cover for “Peace” is being shown on CNET’s website as an example of one e-book title that is having its DRM dropped by Tor Books. Read the article HERE.